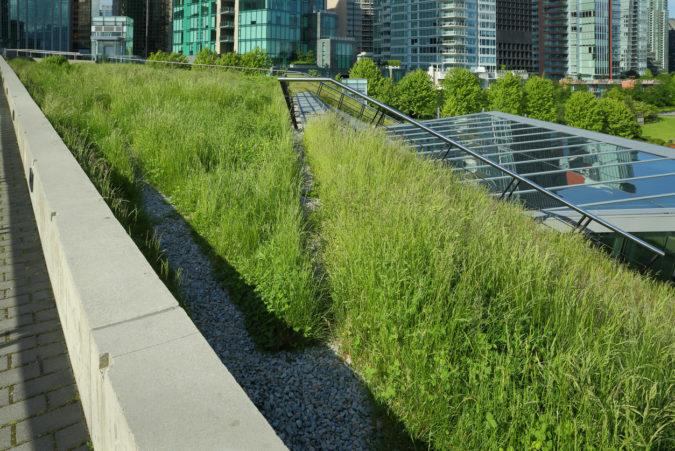 Vegetative, or green, roofs have been around for years, and have long offered promises of energy savings, reductions in storm-water runoff, beautification, and LEED points. However, many facilities have hesitation going green. This is partially due to fear of the unknown and the perception that green roofs may be more trouble than they were worth. Recently, however, the trend has shifted and more facilities are going green. It may be time for you to do the same. Here is some information to help decide if a green roof would benefit your facility. Simply put, a green roof is either fully or partially covered with some kind of vegetation and a growing medium. Visually, they transform your bare (and let’s face it, ugly) roof into a kind of garden, but there are other benefits, too. Green roofs reduce the absorption of the sun’s heat on the roof, which will significantly reduce the heat load on the facility’s HVAC system. Beyond that, the natural evaporation of water facilitates the cooling effect. In the U.S. it is common for facility roof membranes that get direct sun exposure to experience temperature swings greater than 120°F over the course of a year. Drastic temperature swings and UV radiation can significantly deteriorate a roof membrane. Green roofs retain a portion of rainwater, which will control its release into the environment. In an urban setting where there may not be sufficient land for the installation of storm water ponds, green roofs serve as a significant catalyst. Can Your Roof Handle Being Green? Green roofs weigh more than traditional roofs. After all, there’s the added weight of vegetation, growing medium, and retained water. So, new roofs need to be designed to support this weight, and existing roofs will have to be evaluated by a structural engineer to ensure they are up to the task. A facility roof can be a hostile environment for plants. High temperatures, direct sunlight, and high winds can all make for a tough climate for plants. You will want to select plants that can survive drought conditions, thrive in shallow soil, and can be subjected to sudden periods of high water levels. Green roofs often require additional layers to protect the roof membrane from root damage, as well as a drainage system to move excess water to the roof drain. It’s hard to calculate the energy savings because there are so many variables at work including the building’s location, square footage, and height. Tall buildings will see the greatest savings in energy for the top floors (as much as 20%), whereas two-story buildings will see 10-12% summer savings for the whole facility. You can read more about energy savings here. If you’re looking for the cheapest roofing option, green roofs are not it. EPA estimates that green roofs will increase the cost of a roof on average by $10 to $15 per square foot, with additional annual maintenance costs of about one dollar per square foot. But weigh that expense against your annual energy savings, and the ROI may be worth it. Read these FAQs for more information. For help on upgrading your roof, contact Vanguard Resources.